Share the post "Enlarged Uterus"
The uterus, or womb, is designed to expand from the size of a fist to the size of a watermelon. Nature makes it flexible to hold a growing baby. But an enlarged uterus can also occur when a woman has fibroids. 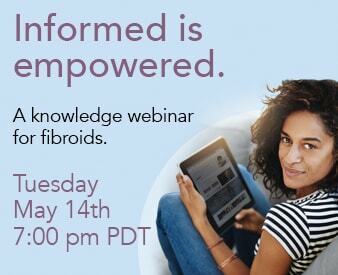 While fibroids are not cancer, they are a kind of tumor. Fibroids are benign (noncancerous) growths, capable of becoming very large. Sometimes, very quickly. Untreated, a uterine fibroid may grow to the size of a full term baby. More commonly, multiple fibroids create a mass that expands the uterus just like a pregnancy. A fibroid enlarged uterus not only impacts your figure, but your mobility, fertility and overall health. Fibroids very commonly affect women over the age of 30. Their development has been linked to a fluctuation in estrogen. High or spiking estrogen levels seem to trigger fibroids. But the central key to their growth, the reason they get so big, is blood supply. The more blood a fibroid gets, the bigger it grows. The larger it becomes, the more it pushes out the uterine wall. Unchecked, fibroids can fill, then expand your womb. Just like a baby would. And like carrying a baby, carrying a uterus full of fibroids can be exhausting. Women experience pelvic pressure. Back aches. Restriction of movement. Sleep is negatively affected. But a fibroid enlarged uterus won’t end in 9 months as a pregnancy would. A fibroid enlarged uterus can make you suffer for years. A fibroid enlarged uterus may also affect your fertility. How much uterine space is left for a baby to grow, if the womb is already occupied by fibroids? How can an embryo implant if uterine walls are stretched to accommodate a large fibroid or multiple fibroids? A fibroid enlarged uterus makes conception and pregnancy difficult. Not impossible. But very challenging. Remember what you just read about why fibroids grow so large and so fast? Blood supply. Uterine Fibroid Embolization is a minimally invasive procedure that selectively blocks the blood vessels leading to each fibroid. Other uterine tissue is not affected. Fibroids, starved of blood, begin to shrink. And the fibroid enlarged uterus starts to shrink too. Is Uterine Fibroid Embolization the right treatment for you? Learn more about it here.